The Chicago Food Swap is thrilled to announce our sponsors for the upcoming September 15 swap at Peterson Garden Project: Jarlsberg USA and Woolwich Dairy. Participants in the September swap will have the opportunity to sample delicious cheeses from Jarlsberg USA and Woolwich Dairy, as well as learn more about the artisan traditions behind their outstanding products. In addition, two lucky swappers will be selected to create an original recipe incorporating Jarlsberg USA and Woolwich Dairy cheeses into their swap items. Jarlsberg Cheese has been imported to the US from Norway for over 45 years and is the top-selling specialty cheese in the country. Known for its mild, nutty taste, Jarlsberg is a cow’s milk that is made in giant, 20-lb. wheels. Jarlsberg makes an outstanding grilled cheese and elevates the taste of any sandwich it adorns. Jarlsberg USA also imports some lesser-known but very worthy cheeses, such as the unique, caramelized Ski-Queen Gjetost cheese and spreadable Snofrisk cream cheese. Woolwich Dairy is North America's leading producer of goat cheeses. Known for its soft, unripened goat cheese Chevrai, which comes in ten delicious varieties, Woolwich Dairy also produces goat cheddar, feta and mozzarella.Woolwich Dairy goat cheese are a fantastic addition to any cheese board. 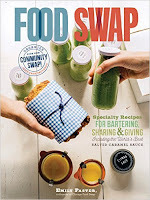 The Chicago Food Swap will select two swappers to create original recipes -- one using Jarlsberg USA products and one using Woolwich Dairy products -- and bring their cheesy creations to the September swap. The selected swappers will be reimbursed for their expenses in creating their recipes (up to $25 each). The recipes will be posted on the Jarlsberg USA blog and included in Jarlsberg newsletter, which has over 4000 subscribers. That should give you some bragging rights! To be considered for the opportunity to create an original swap item incorporating Jarlsberg and Woolwich Dairy cheeses, please leave a comment to this post or email Chicago Food Swap founder Emily Paster at chicagofoodswap@gmail.com explaining why you would like to use Jarlsberg or Woolwich Dairy products in your swap items. Emily will select the two lucky swappers. Note: you must be registered for the September swap to be considered. Looking forward to seeing everyone at the September swap and sampling some delicious cheese!